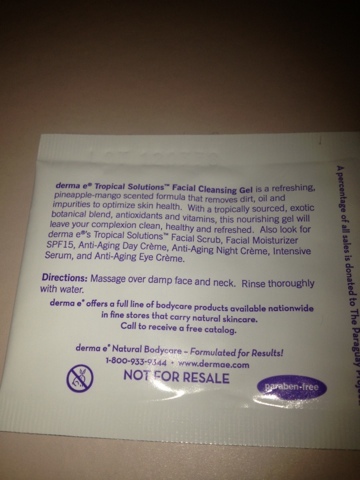 I haven't really done any skin care reviews so I was really happy to receive some products from Derma e. If you have never heard of Derma e, they have been providing high quality natural product for 28 years. The brand source the finest quality ingredients that have been proven to promote healthy, beautiful and younger looking skin. All their products are free from parabens, phthalates, sodium lauryl sulphates, petrolatum, mineral oil, artificial colours, pH balanced and are 100% cruelty free. Facial cleansing Gel." Rinses dirt, oil and impurities to optimise skin health with this rejuvenating formula. 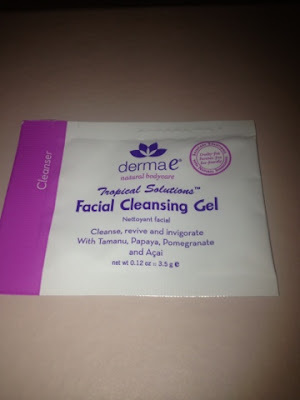 This refreshing gel utilizes a tropically sourced, exotic botanical blend, antioxidants and vitamins to leave your complexion clean, healthy and refreshed ." 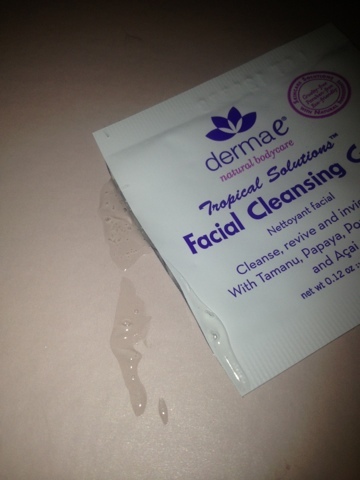 The cleasner is infused with Tamanu, (an oil topically used to promote healthy, clear, blemish-free skin ), Papaya, Pomegranate and Açai ( an anti oxidant and anti ageing ingredient) . It smells gorgeous, it is scented with pineapple and mango and reminds me of sipping a cocktail by a gorgeous sandy beach ( just what you need this time of year in England!!). I love the gel formula, it has a lightweight and non greasy. I cleansed my face by massaging it with some warm water as i would do normally. It didn't foam or lather, which I dont think you get that with a gel. It washed away all of my make up and left my skin feeling really clean, fresh and moistuised, some cleansers leave my face feeling tight and dehydrated but this did not. Effectivness- It does exactley what it says on the bottle, cleasned and washed away make up, leaving my skin refreshed and clean. Packaging- A little boring but it explains everything that you need to know. Ooo, never seen this before. Looks good! I really loved when I read "free from parabens, phthalates, sodium lauryl sulphates, petrolatum, mineral oil, artificial colours, pH balanced and are 100% cruelty free"
I've nominated you for the Liebster Award! I hope you enjoy my questions, go and check it out over at my blog and let me know if you do it! I love a gel consistency, and it feels incredible if you keep it in the fridge! There is nothing worse than skin that looks dull and lifeless. If you have noticed that your skin is lacking its lively glow, there could be several reasons why this is the case. It could be due to lack of sleep or improper hydration. However, the biggest reason why people experience a lack in brightness when it comes to their skin is because of dirt buildup and residue.